What is the difference between a phonetic sign and a logogram? Which one does English use? Why are examples of Maya books so rare? Was reading and writing likely a skill practiced by common or poor Maya? Can you think of any modern professions similar to that of scribe? The Maya writing system (sometimes called hieroglyphs from a superficial resemblance to the Ancient Egyptian writing) is a logosyllabic writing system, which means that it combines phonetic signs (or glyphs) representing sounds and syllables with logograms – glyphs representing entire words. While English uses 26 letters, 10 numerals, and various marks of punctuation, Maya writing is much expansive. At any one time, no more than around 500 glyphs were in use, some 200 of which (including variations) were phonetic. Both are pronounced b’alam and carry the same meaning. Phonetic glyphs could be combined into a single drawing to create a multi-syllable word. For generations, this confused linguists working to decipher the writing – but when it was recognized, it proved to be the key to understanding written Mayan. The Maya writing system is one of the outstanding achievements of the pre-Columbian inhabitants of the Americas. It was the most sophisticated and highly developed writing system of more than a dozen systems that developed in Mesoamerica. The earliest inscriptions in an identifiable Maya script date back to 300–200 BC. The bar-and-dot counting system that is the base of Maya numerals was in use in Mesoamerica by 1000 BC; the Maya adopted it by the Late Preclassic, and added the symbol for zero. This may have been the earliest known occurrence of the idea of an explicit zero worldwide, although it may have been predated by the Babylonian system. The earliest explicit use of zero occurred on Maya monuments is dated to 357 AD. List of Maya numerals from 0 to 19 with two vertically-oriented examples. The Maya script was in use up to the arrival of the Europeans, with its use peaking during the Classic Period. In excess of 10,000 individual texts have been recovered, mostly inscribed on stone monuments, lintels, stelae and ceramics. The Maya also produced texts painted on a form of paper manufactured from processed tree-bark generally now known by its Nahuatl-language name amatl used to produce codices. The skill and knowledge of Maya writing persisted among segments of the population right up to the Spanish conquest. The knowledge was subsequently lost, as a result of the impact of the conquest on Maya society. Pages 6, 7, and 8 of the Dresden Codex, showing letters numbers and the images that often accompany Maya writing. In an effort to suppress the Maya religion and to forcibly convert the Maya to Christianity, the Catholic Church and colonial officials, notably Bishop Diego de Landa, destroyed Maya texts wherever they found them, and with them the knowledge of Maya writing. By chance three pre-Columbian books dated to the Postclassic period have been preserved. These are known as the Madrid Codex, the Dresden Codex and the Paris Codex. A few pages survive from a fourth, the Grolier Codex. Archaeology conducted at Maya sites often reveals other fragments, rectangular lumps of plaster and paint chips which were codices; these tantalizing remains are, however, too severely damaged for any inscriptions to have survived, with most of the organic material having decayed. Our knowledge of ancient Maya thought must represent only a tiny fraction of the whole picture, for of the thousands of books in which the full extent of their learning and ritual was recorded, only four have survived to modern times (as though all that posterity knew of ourselves were to be based upon three prayer books and ‘Pilgrim’s Progress’). A modern painting depicting Diego de Landa as he burns the sacred books of the Maya. He sought to destroy what he saw as black magic and pagan ideas in his efforts to convert the Maya people to Christianity. His own writings – secondhand accounts of the texts he destroyed – have proven useful to modern scholars attempting to piece together the lost world of the pre-Columbian Maya. According to Spanish accounts, Maya books contained histories, prophecies, maps, tribute ledgers, songs, scientific observations, and genealogies – but only four examples of Maya books have survived to the modern day, and they are all ritual/religious books. Painted pictures and carvings depict Maya books with jaguar-skin covers, painted by specialized scribes using brushes or quills dipped in conch shell inkpots, but as far as we can tell in the modern day, none of these material artifacts has survived the Spanish conquest or the humid jungle. Commoners were probably illiterate; scribes were drawn from the elite. It is not known if all members of the aristocracy could read and write, although at least some women could, since there are representations of female scribes in Maya art. 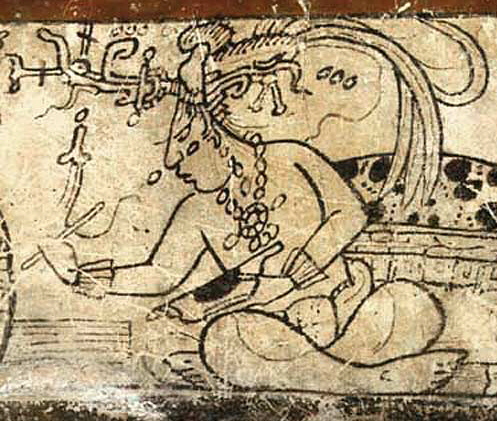 Maya scribes were called aj tz’ib, meaning “one who writes or paints.” Although the archaeological record does not provide examples of brushes or pens, analysis of ink strokes on the Postclassic codices suggests that it was applied with a brush with a tip fashioned from pliable hair. There were probably scribal schools where members of the aristocracy were taught to write.